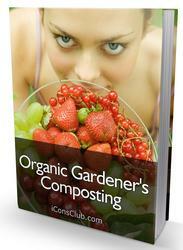 Some of the gardener's tasks are made much easier with the use of power tools organic matter. Here are some important facts about the most useful types. Chippers and shredders. Chippers have one or more knives to slice woody material into small pieces. Shredders pulverize with hammers or other mechanisms; they work best with softer material. Many models carry out both functions. To shred leaves without frustration, buy a machine designed specifically for that purpose. Large models (8 to 10 horsepower with chipping tubes 4 inches or wider) usually take branches up to 3 inches in diameter, while smaller ones take only 1 ]A-inch branches. 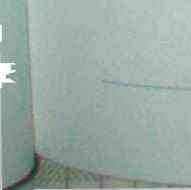 Replace or sharpen blades often. Chip woody material while still green and prune off side branches before chipping. Place machine on a tarp for easy collection of chips. String trimmers. A trimmer has a small motor on one end that drives a spinning, sturdy nylon line. The cord spins so rapidly that it easily shears off plants. Use it to mow very long grass or weeds and to trim lawns around stones. (Avoid trimming right next to trunks, as you could injure the plants.) It is also excellent for chopping taller green manures before turning under. Gas models cut heavier weeds than most electric ones. A few models automatically dispense line as it wears off, but most require bouncing the machines head on the ground to release replacement line. Lawn mowers. 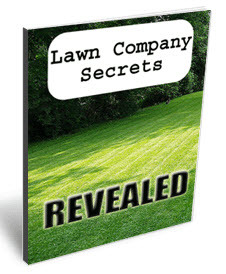 Mowers are no longer simply lawn-cutting tools. Newer models ore composting machines that chop grass finely so that it decomposes in place, returning nutrients to lawns Bagging models are still useful for collecting grass clippinas for the compost heap. Any mower can chop leaves for compost or mulch; just run over small, raked piles. ► Dress appropriately. A long-sleeved shirt and long pants help protect your arms and legs. Make sure they're comfortable but reasonably tight fitting, so there's nothing to get caught in moving blades! Since sneakers or running shoes offer little resistance to these machines, wear sturdy shoes or boots with socks. Work gloves are important when using choppers and shredders. Remember that it cart take years for subtle hearing loss from power tools to show up, so be sensible and wear ear protectors. As a reward, you'll find mowing the lawn and similar tasks much less stressful. Protect your eyes from flying debris with goggles. Bye protection is absolutely essential with chippers and shredders. Always turn off the motor (unplug electric tools) before attempting to unclog or fix an engine. Before buying a new piece of equipment, make sure it has some sort of safety mechanism that shuts it down when you let go. 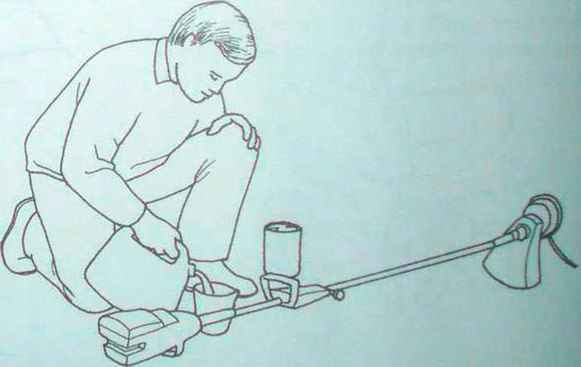 This can prevent a tiller or lawn mower from running over you if yoti slip. String trimmers should stop spinning as soon as you release the trigger. Keep children, spectators, and pels a safe distance away. Lawn mowers, chippers. and shredders can throw stones a distance of several yards. Remove branches and similar obstacles from the work area before you turn on equipment. Allow engines to cool a few minutes before refilling with gas; gas spilled onto a hot engine could ignite. Use a funnel whenever pouring gas or oil to minimize spills on your skin, your tools, and I he-ground. It takes only a few teaspoons (ml) of gas or oil to contaminate water supplies or soil. Dispose of old gasoline and used oil properly; take oil to a garage for recycling. Label all oil and gas cans clearly and keep out of reach of children. labeling containers of oil/gas mixtures will prevent the expensive mistake of using them instead of straight gasoline. Plug electric tools only into outlets with a ground fault circuit interrupter (GFCQ. These specialized outlets shut off the power anytime there's a short circuit, greatly reducing your risk of serious shock. Check power cords before and after each use; replace damaged conk before using. These machines can be powered by gasoline or electricity. Electric models are quieter and lighter, and require less maintenance. A few electric trimmers and mowers have rechargeable batteries, eliminating the need for cords. Rototillers and their smaller cousins save effort in all the tasks that involve dicing or mixing soil. If you're cultivating over half an acre, a large machine is worthwhile, but most gardens don't need the large, expensive models. The heavier the equipment, the greater the risk of compacting soil. Once your garden is established you'll probably find that a smaller, lighter, less expensive model is more fun to use and tetter suits your needs. Consider renting or borniwii large machin< if you're startifq new garden. If you remove first and compost it (a good idea any case), you can use a >ma] model even for a new garden. Cultivator. Small, lightweight machine, usually 1 to 2 horsepower (hp); tines are directly below engine on most models. 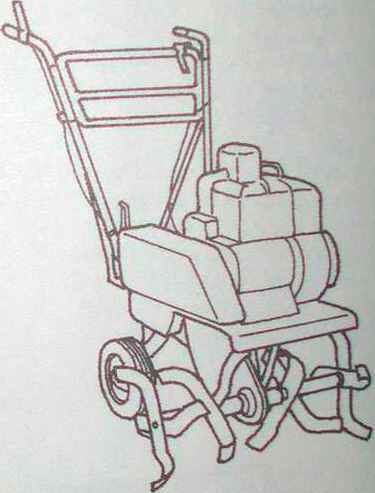 No wheels; user pushes or drives the rotating tines through the soil. Most are gas-powered; a few electric models are available. Tilling widths average 6 to 10 inches. Optional attachments include edgers, lawn aerators, and lawn dethatchers. least expensive. Good for weeding and loosening soil to 4 or 6 inches deep and for mixing fine amendments to that depth (effective depth usually less than manufacturers claim). Easy to maneuver around existing plants. Front- and mid-tine tillers. 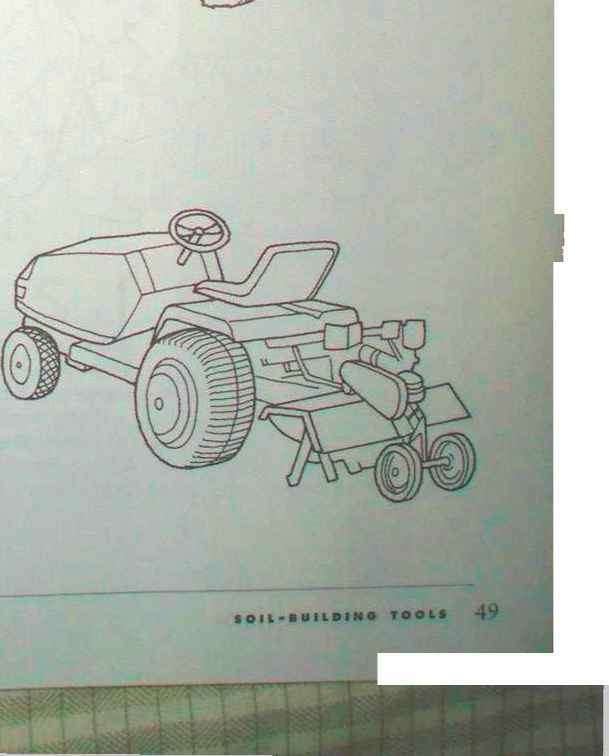 Larger than cultivators, but relatively small and lightweight, with gasoline engines up to 4 or 5 hp; tines are directly below or slighf'y in front of engine. 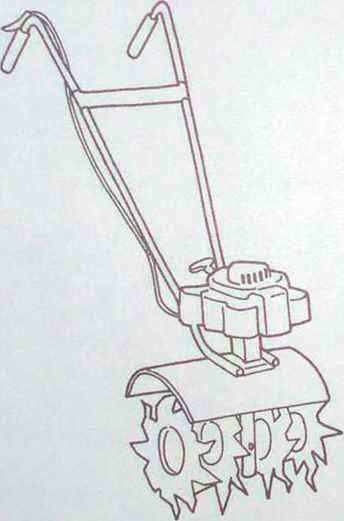 User pushes or drives the rotating tines through the soil. Cultivating width is usually 1 2 to 18 inches. Optional attachments may include one or two detachof wheels, edgers, lawn aerators, lawn dethatchers, end a hilling/furrowing device. Price varies with size. More is not better when it comes to rototilling. You can actually destroy the crumbly structure you've worked so hard to create by overusing these machines. Compaction of subsurface soil from overriding is so common that it's got a name of its own: plow pan or tillage pan. Rear-tine tillers. Larger, heavier, gas-powered machines; 5 hp is common, but 8 and 1 2 hp models are available. Wheels are powered and drive the machine in a straight line, making these easier to use thon front-or mid-tine tillers if gardens are large. Cultivating width averages 1 8 inches, but adding tines can increase this to 25 or 30 inches. Expensive. Good for weeding only in very large gardens where rows are widely spaced (hard to turn in small bedsj. Excellent for turning under amendments, organic matter, and green manures; larger engines can break sod and hard or rocky ground. Tractor-mounted tillers. Heavy machines that are either powered by the tractor or self-powered; tilling widths are 20 to 48 inches (even wider on a few models). Expensive. Perform all of the same functions that other fillers do. 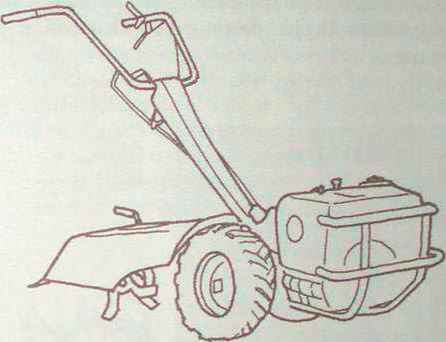 Make sense only for large gardens and people who already have lown or garden tractors. Extra weight increases the risk of compacting soil. Basic maintenance is even more important for ]x>\ver tools than it is for hand tools to assure a long, useful life. A few simple steps should keep machines running for at least 15 years without an overhaul. (After 15 years, a professional overhaul can double a tool's usable life.) Servicing small engines requires no special tools or skills. With average use, the following fall tune-up should be all that's needed, aside from checking the oil (and gas!) 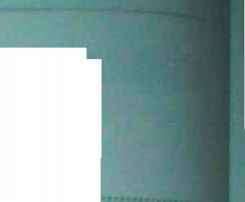 level before each use. Heavy use may require more frequent oil changes; follow the manufacturer's recommendations. Occasional cleaning is also a gtx>d idea. Brush, wipe off, or clear machines whenever the outsides or moving parts become caked with plant debris or mud. Clean soil off tillers after every use. 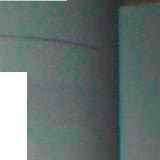 The ceramic insulator should brown '<> gray. If-fttHfe tor has burned to white, or ii the plug end is ( overt d w rh n . •• .rr black oil take your engine in for a professional tune-up. pun the engine to use up oil the gas before storing tools for ^nier. j add gasoline stabilizer (available at auto parts stores) and run the mcton I briefly to mix it in. Either is easier and safer than draining the gas; DO» | prevent engine clogging. Buy fresh gas next year. String trimmers and other tools that use gas mixed with oi shou'a be left empty whenever they won't be used for a month. Mix only small amounts of oil and gas at one time; discard the mixture after eight week* Store in a tight, labeled container.